In order to keep windshield areas free of ice, frost, and fog, window anti-icing, deicing, and defogging systems are used. These can be electric, pneumatic, or chemical depending on the type and complexity of the aircraft. High performance and transport category aircraft windshields are typically made of laminated glass, polycarbonate, or similar ply material. Typically clear vinyl plies are also included to improve performance characteristics. The laminations create the strength and impact resistance of the windshield assembly. These are critical feature for windshields as they are subject to a wide range of temperatures and pressures. They must also withstand the force of a 4 pound bird strike at cruising speed to be certified. The laminated construction facilitates the inclusion of electric heating elements into the glass layers, which are used to keep the windshield clear of ice, frost, and fog. The elements can be in the form of resistance wires or a transparent conductive material may be used as one of the window plies. To ensure enough heating is applied to the outside of the windshield, heating elements are placed on the inside of the outer glass ply. Windshields are typically bonded together by the application of pressure and heat without the use of cement. 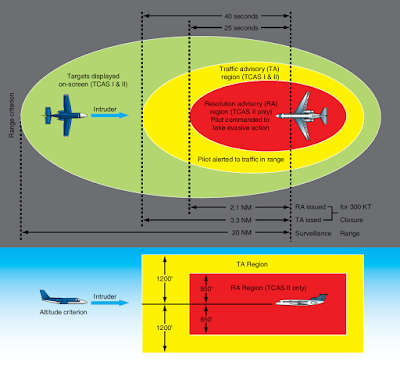 Figure 1 illustrates the plies in one transport category aircraft windshield. Whether resistance wires or a laminated conductive film is used, aircraft window heat systems have transformers to supply power and feedback mechanisms, such as thermistors, to provide a window heat control unit with information used to keep operating temperature within acceptable limits. Some systems are automatic while others are controlled by cockpit switches. Separate circuits for pilot and co-pilot are common to ensure visibility in case of a malfunction. Consult the manufacturer’s maintenance information for details on the particular window heat system in question. 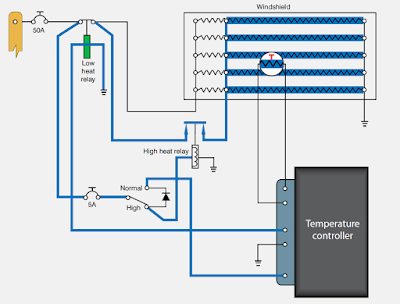 Some windshield heating systems can be operated at two heat levels. On these aircraft, NORMAL heating supplied heat to the broadest area of windshield. HIGH heating supplies a higher intensity of heat to a smaller but more essential viewing area. Typically, this window heating system is always on and set in the NORMAL position. 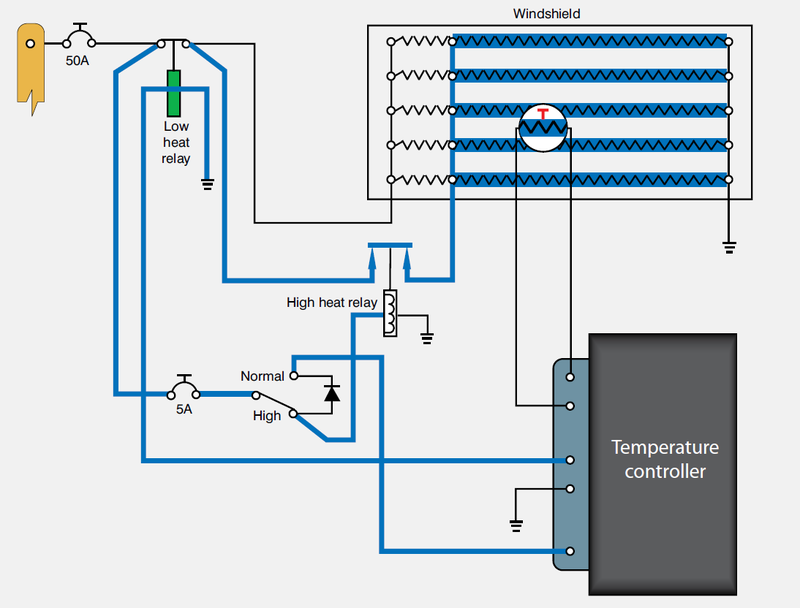 Figure 2 illustrates a simplified windshield heat system of this type. Some laminated windshields on older aircraft have a space between the plies that allows the flow of hot air to be directed between the glass to keep it warm and fog free. The source of air is bleed air or conditioned air from the environmental control system. Small aircraft may utilize ducted warm air, which is release to flow over the windshield inner surface to defrost and defog. These systems are similar to those used in automobiles. The source of air could be ambient (defog only), the aircraft’s heating system, or a combustion heater. 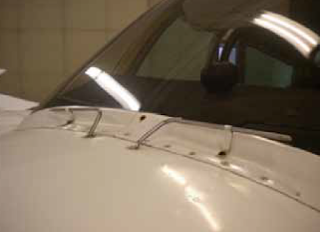 While these pneumatic windshield heat systems are effective for the aircraft on which they are installed, they are not approved for flying into known icing conditions and, as such, are not effective for anti-ice. Large aircraft equipped with pneumatic jet blast rain repellant systems achieve some anti-icing effects from operating this system although electric windshield heat is usually used. 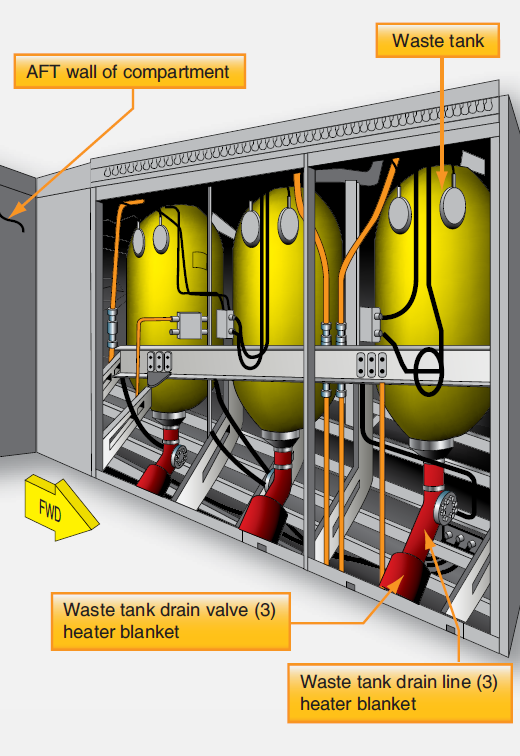 Chemical anti-ice systems exist generally for small aircraft. This type of anti-ice is also used on windshields. Whether alone or part of a TKSTM system or similar, the liquid chemical is sprayed through a nozzle onto the outside of the windshield which prevents ice from forming. The chemical can also deice the windshield of ice that may have already formed. 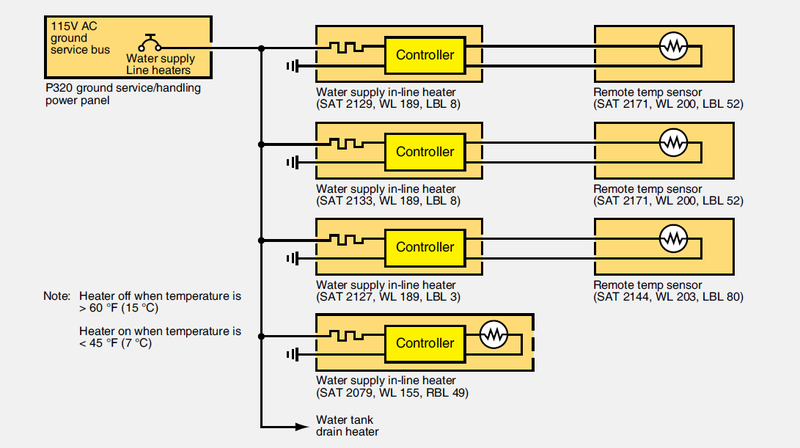 Systems such as these have a fluid reservoir, pump, control valve, filter, and relief valve. Other components may exist. Figure 3 shows a set of spray tubes for application of chemical anti-ice on an aircraft windshield. Transport type aircraft have water and waste systems on board, and electrical heaters are often used to prevent the formation of ice in the water lines of these systems. Water lines carry water from the portable tanks to the lavatories and galleys. The waste water tanks collect the gray water from the galleys and lavatories. Heater blankets, in-line heaters, or heater boots are often used to heat the water supply lines, water tank drain hoses, waste drain lines, waste tank rinse fittings, and drain masts. 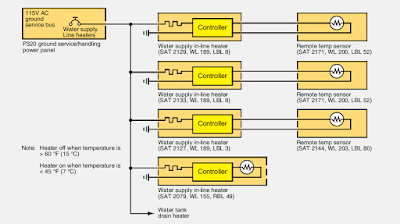 Thermostats in the water lines supply temperature data to the control unit that turns the electrical heaters on and off. When the temperature falls below freezing, the electrical heaters turn on and stay on until the temperature reaches a safe temperature. Figure 4 is a schematic of a water supply line heater system, and Figure 5 shows the location of the waste water tanks and heater blanket.